School principals say Leaving Certificate reforms are urgently needed to ease some of the anxiety it is causing among students. The warning comes as almost 121,000 students prepare to begin their Junior and Leaving Cert exams on Wednesday. The National Association of Principals and Deputy Principals said pressure caused by the high-stakes, terminal exam was causing some students to spend much of their time at second level in “perpetual anxiety”. Almost 121,000 Leaving and Junior Certificate candidates begin their exams today with the best wishes of the country behind them, including a good luck tweet from Education Minister Richard Bruton. National Association of Principals and Deputy Principals director Clive Byrne said it was time for students to showcase their creativity and knowledge. About 70 students iin this year’s Leaving Cert exams face sitting three exams in a single day due to subject clashes and timetable congestion. School principals have called for Leaving Cert exams to be held on Saturdays to help ease “appalling” pressure on students. About 70 students in total in this year’s exams face sitting three exams in a single day, over the course of about nine hours, due to subject clashes and timetable congestion. Director of the National Association of Principals and Deputy Principals Clive Byrne said the report shows that schools will deliver when they are given the right kind of supports. He said: “While today’s findings are very encouraging, I am also mindful of the remaining challenges for secondary education. There has been a marked deterioration in the standard of Irish among pupils in primary schools. A new report raises concern over the quality of teaching of Irish at primary and secondary level. It is one of a number of issues raised in the latest report by the Chief Inspector of the Inspectorate of the Department of Education and Skills, Harold Hislop. Online sexual coercion, or “webcam blackmail”, is to be addressed in the classroom under a new internet safety initiative. 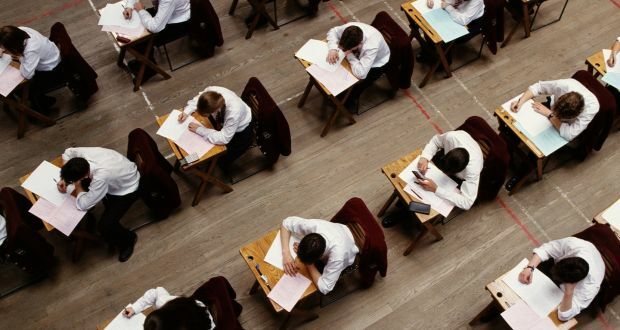 There have been calls for teachers to carry out Leaving Certificate oral examinations during the Easter break – due to concerns over a shortage of state examiners. The National Association of Principals and Deputy Principals is backing the idea. A new internet resource for Second and Third Year SPHE classes aims to empower teens to deal with the ‘sextortion’ threat, writes Katherine Donnelly. A recent survey of Irish second-level students showing that one in three Sixth Year pupils have sent a sexually explicit image is a wake-up call for those not already alert to the full extent of the perils of the online world. School heads propose changing exam dates to tackle crisis in recruiting examiners. School principals have proposed moving the Leaving Cert oral exams to the Easter holiday period to ease acute pressure on recruiting examiners for key subjects. Funding for post-Leaving Certificate courses will depend on their ability to match the staffing needs of local employers, under proposed new regulation of the sector.